Peel and roughly chop potatoes. Discard tops and bottoms of green onions and mince the remaining pieces. Add potatoes and onions to a medium-sized saucepan and cover with water. Boil on high for 30 minutes, adding more water to the pot as needed, until potatoes as well cooked and soft. Remove pot from heat and drain the water over a strainer until it is just under the level of your cooked potatoes. Return any onions and basil the strainer catches to the pot. Add 2 1/2 cups milk to potatoes and mash until mostly smooth, leaving a few small chunks for a hearty texture. Add more milk, a dash at a time, until soup reaches your preferred consistency. Season liberally with salt and pepper to taste. Return pot to the stove and heat, stirring frequently, for 2-3 minutes. Serve garnished with additional green onions if desired. This simple soup is the perfect starting point for the potato soup novice. 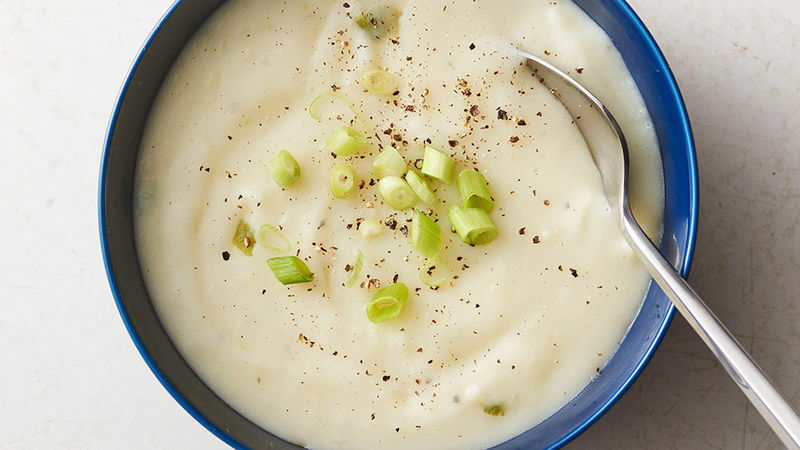 However, with just a few additions you can transform this unbelievably easy potato soup into an even heartier (but still unbelievably easy) loaded baked potato soup. All it takes is some chopped bacon, carrots, cheese and voilà! And speaking of easy potato recipes, here’s how to boil a potato the right way.